As some of you know, I have written about the importance of considering workspaces in addressing the needs of introverts. Author Ryan Jenkins has written a comprehensive guide to getting the best out of Millennials and in this guest post Ryan makes a strong case for creating functional and flexible workspaces that cater to all styles. Check out this book. It is a great read! The envelope of today’s workspaces is being pushed further and further. Facebook recently moved into their new 430,000 square foot “garden-roofed fantasyland” office. Apple has plans for a new Cupertino campus that resembles a giant alien spacecraft. And a new Mountain View headquarters at Google will have miles of super-transparent glass and an interior workspace that can be reshaped by cranes and robots according to the company’s needs. If Steve Jobs taught us anything, it’s that design matters. The better the design, the better the experience and the higher the engagement. The same applies to today’s workspaces. Seventy-eight percent of Millennials were strongly influenced by how innovative a company was when deciding if they wanted to work there. It’s no wonder so many of today’s tech giants are investing heavily into new innovative workspaces. Besides creating a functional workspace, the office’s design is being used as a recruiting and employee engagement tool. What does the design of your workspace communicate to potential new hires and existing employees? Seventy-nine percent of Millennials would rather be mobile than static while working. It’s become more and more challenging to engage the next generation of employees at work. Providing workspaces that entice collaboration and offer unique experiences are a must. Work-life integration has replaced work-life balance. Nowadays, we take home more work and we want more life at work. More employees (especially Millennials) are looking for companies that offer a rich and immersive experience at work. And that starts with the physical workspace. Here are four workspace elements that will engage the Millennial worker. 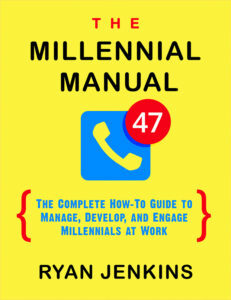 According to the 2014 Qualtrics Millennials in Tech Survey, 74 percent of Millennials ranked a collaborative work environment as the first or second most important characteristic they look for in the workplace. The quickest way to boost collaboration is to observe where your team naturally gravitates. Once the high traffic areas are located, encourage the collaboration by offering food or drinks nearby, placing stools or high tables at the location, or streaming wifi to the area. Millennials are more productive and ultimately have a better impression of their employer when they have workplace flexibility. In fact, 90 percent of managers believe that workers are more productive when given the flexibility to choose when and how they work. Cater your workspace to meet a wide range of needs and interest by offering solo workstations, mobile workstations (e.g. desks with wheels), small team rooms, large conference rooms, lounge areas, and relaxed community area. Company values that are visible on a daily basis will help to engage the Millennial generation who are massively motivated by meaningful work. Bring your company values to life by naming meeting rooms after each value, writing them on the walls, printing them on business cards, looping them on digital displays, or creating images or badges that employees can share on social media. Millennials value a healthy lifestyle and are interested in blending that lifestyle with work. Natural light enhances energy and results in more productivity; find ways to leverage natural light in your workspace. The right colors can brighten moods. Color psychologists have found that green promotes calm, blue is stimulating, and yellow spurs creativity. Other perks that can promote a healthy workspace: ergonomic chairs, meditation space, nap rooms, dogs at work, and standing desks. For more examples and inspiration on how you can create an innovative workspace, search “modern workplace” or a related search term on Pinterest. Barry Salzburg, the former global CEO of Deloitte Touch Tohmatsu Limited, recently said, “To attract and retain talent, business needs to show Millennials it is innovative and in tune with their world-view.” Leverage an innovative and forward-thinking workspace as your catalyst for Millennial engagement. This entry was posted in Uncategorized on June 15, 2017 by Jennifer Kahnweiler.